Participants at a conference of the world's foremost analogy researchers learned about an important finding in the videogame research being conducted at the Center for Educational Technologies. Dr. Debbie Denise Reese, principal investigator of the CyGaMEs project at the Center for Educational Technologies®, revealed the new information at the Analogy '09 conference held July 24-27 at the New Bulgarian University's Central and East European Center for Cognitive Science in Sofia, Bulgaria. CyGAMEs carries out research that first began with the NASA-funded Selene project. Selene: A Lunar Construction GaME is the videogame created as part of the gaming research. CyGAMEs is funded by the National Science Foundation. Reese announced at the conference that CyGaMEs has successfully identified where learning occurred during gameplay by matching CyGaMEs embedded gameplay assessments with video footage of gameplay. This accomplishment is important because it is a first step in generating a quantitative methodology validating how authentic assessments can measure learning while people are actively engaged in virtual learning environments. Reese triangulated video footage with measures collected by the Selene game. The findings were part of Reese's presentation of her paper, Structure Mapping Theory as a Formalism for Instructional Game Design and Assessment. 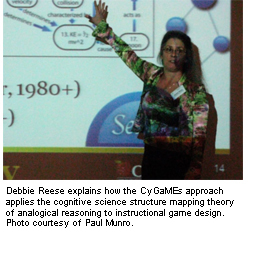 Reese also discussed the application of Dedre Gentner's structure mapping theory of analogical reasoning in instructional game design. Gentner is one of three world-eminent analogy scholars who organized the conference as a follow-up to the July 1998 conference in Sofia that resulted in The Analogical Mind, edited by Gentner, Holyoak, & Kokinov (MIT Press, 2001). Analogy '09 discussed key ideas in the field and analyzed progress over the past decade.